The International Whaling Commission (IWC) imposed a moratorium on commercial whaling in 1986. 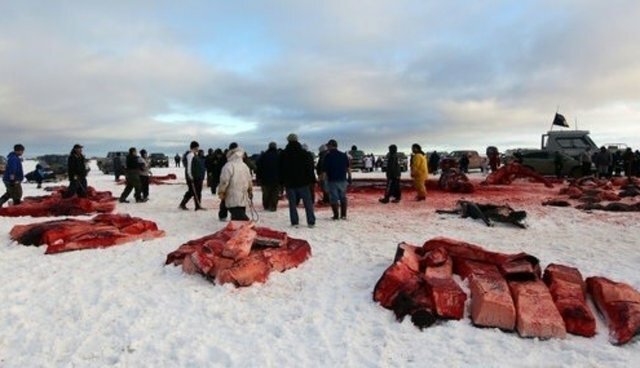 However, the IWC has a longstanding policy of allowing certain indigenous peoples in Alaska to hunt otherwise protected whales to satisfy aboriginal subsistence needs. However, this exception is being abused by tourists and visitors who wish to consume whale meat and use whale products. Because of this growing problem, the International Marine Mammal Conservation Society and the Global Conservation Group have partnered up on a campaign called "Spread the Word" aimed at lowering the legal number of whales that can be "harvested" in Alaska. The organizations will be targeting the International Whaling Commission and the Alaska Whaling Commission. To cover the costs of campaign advertisements, action alerts and legal fees, the organizations are asking for support. They created a joint fundraising page, which can be viewed by clicking here. According to the Global Conservation Group's Vice President of Campaigns, Tim Green, "Whaling is bad because it is an expensive undertaking and it risks running whales to extinction. We simply cannot afford to run such a significant and valuable part of our ecosystem into extinction". Without whales, plankton will quickly overpopulate preventing essential sunlight from reaching the ocean's plants and animals. This will lead to a massive die-off of even more animals. Help stop whaling! Share this article with friends and consider contributing to the campaign here.